Azure Kubernetes Service (AKS) is a managed Kubernetes service that lets you quickly deploy and manage clusters. 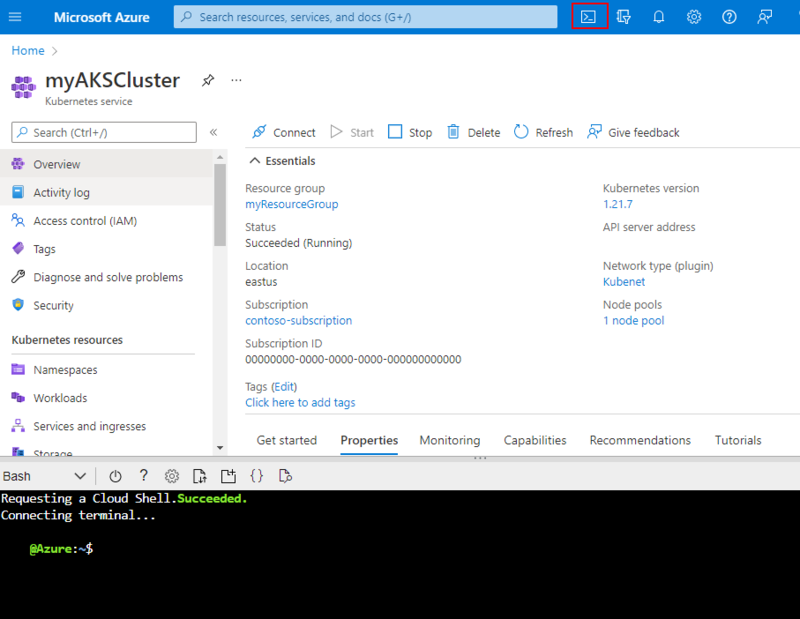 In this quickstart, you deploy an AKS cluster using the Azure portal. A multi-container application that includes a web front end and a Redis instance is run in the cluster. You then see how to monitor the health of the cluster and pods that run your application. This quickstart assumes a basic understanding of Kubernetes concepts. For more information, see Kubernetes core concepts for Azure Kubernetes Service (AKS). In the top left-hand corner of the Azure portal, select + Create a resource > Kubernetes Service. 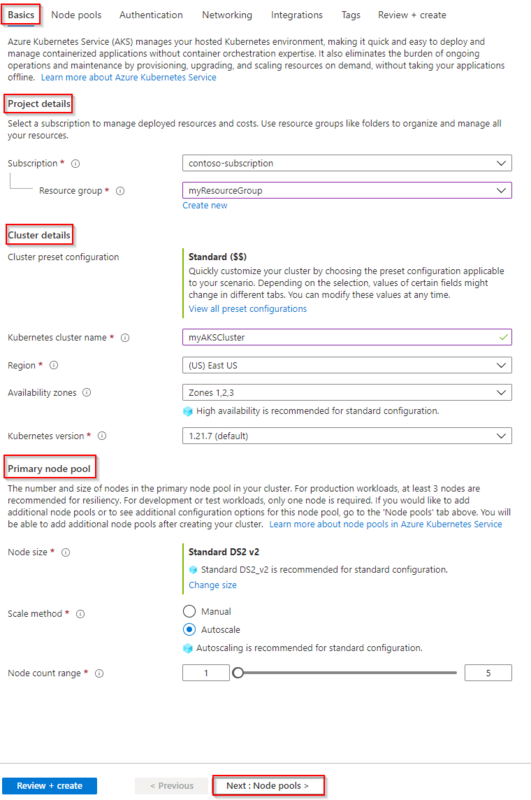 PROJECT DETAILS: Select an Azure subscription, then select or create an Azure resource group, such as myResourceGroup. Enter a Kubernetes cluster name, such as myAKSCluster. CLUSTER DETAILS: Select a region, Kubernetes version, and DNS name prefix for the AKS cluster. SCALE: Select a VM size for the AKS nodes. The VM size cannot be changed once an AKS cluster has been deployed. Select the number of nodes to deploy into the cluster. For this quickstart, set Node count to 1. Node count can be adjusted after the cluster has been deployed. Select Next: Authentication when complete. Create a new service principal or Configure to use an existing one. When using an existing SPN, you need to provide the SPN client ID and secret. Enable the option for Kubernetes role-based access controls (RBAC). These controls provide more fine-grained control over access to the Kubernetes resources deployed in your AKS cluster. By default, Basic networking is used, and Azure Monitor for containers is enabled. Select Review + create and then Create when ready. To manage a Kubernetes cluster, you use kubectl, the Kubernetes command-line client. The kubectl client is pre-installed in the Azure Cloud Shell. Open Cloud Shell using the button on the top right-hand corner of the Azure portal. To verify the connection to your cluster, use the kubectl get command to return a list of the cluster nodes. A Kubernetes manifest file defines a desired state for the cluster, such as what container images to run. In this quickstart, a manifest is used to create all objects needed to run the Azure Vote application. This manifest includes two Kubernetes deployments - one for the sample Azure Vote Python applications, and the other for a Redis instance. Two Kubernetes Services are also created - an internal service for the Redis instance, and an external service to access the Azure Vote application from the internet. In this quickstart, you manually create and deploy your application manifests to the AKS cluster. In more real-world scenarios, you can use Azure Dev Spaces to rapidly iterate and debug your code directly in the AKS cluster. You can use Dev Spaces across OS platforms and development environments, and work together with others on your team. When the application runs, a Kubernetes service exposes the application front end to the internet. This process can take a few minutes to complete. To monitor progress, use the kubectl get service command with the --watch argument. Initially the EXTERNAL-IP for the azure-vote-front service is shown as pending. 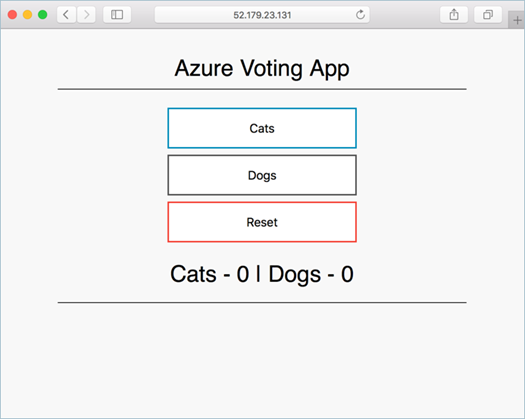 To see the Azure Vote app in action, open a web browser to the external IP address of your service. When you created the cluster, Azure Monitor for containers was enabled. This monitoring feature provides health metrics for both the AKS cluster and pods running on the cluster. Choose to view the Containers. 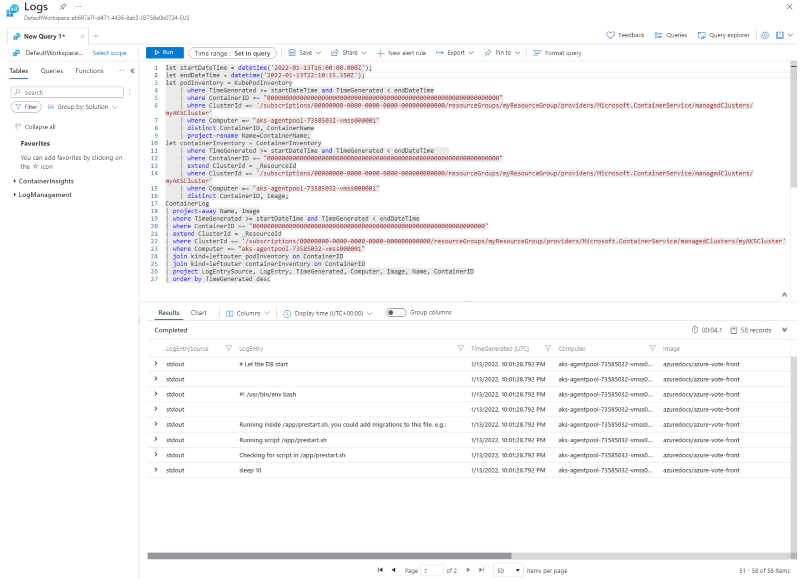 To see logs for the azure-vote-front pod, select the View container logs link on the right-hand side of the containers list. These logs include the stdout and stderr streams from the container. When you delete the cluster, the Azure Active Directory service principal used by the AKS cluster is not removed. For steps on how to remove the service principal, see AKS service principal considerations and deletion. In this quickstart, pre-created container images were used to create a Kubernetes deployment. The related application code, Dockerfile, and Kubernetes manifest file are available on GitHub. In this quickstart, you deployed a Kubernetes cluster and deployed a multi-container application to it. To learn more about AKS, and walk through a complete code to deployment example, continue to the Kubernetes cluster tutorial.